While self-cleaning toilet seats may seem like something you'd find in a Japanese bathroom, one engineer who recently graduated from Purdue University is thinking on a much grander scale. Nick Bradford and a group of fellow student researchers have created an automatic toilet cleanser called the Poseidon IV, without the benefit of electricity, chemicals or rotating seat sleeves. 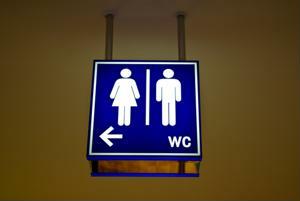 According to the Chicago Tribune, the device uses water pressure from the restroom's plumbing itself. "Everyone has had that feeling," Bradford told the news source. "The public toilet either looks unsanitary or you don't know who used it the last time. It's gross." Instead of using potentially-wasteful seat covers or rely on a system that will further sap the power grid, the Poseidon IV acts like a mini car wash that will descend on the toilet seat when the lid is lowered. Water is then diverted from the restroom's plumbing and is enclosed in a lid that wraps around the toilet seat. High-pressure sprays are connected to three robotic arms and are then wiped clean with tiny wipers that are attached to each one. The result is a sterilized toilet seat that will assuage some of the fears that many individuals will have when visiting a public bathroom. While the device sounds space-age and extremely expensive, the Poseidon IV was built from the ground-up to appeal to strained local budgets. In addition to using an existing power source, the device does away with expensive motion sensors and cuts down on waste significantly produced by toilet seat covers and other sanitary devices. Bradford and his team are hoping to capture a government contract at O'Hare International Airport, reports CMMOnline.com. Since the current system uses a system of rotating plastic sleeves that cover each toilet seat, Bradford and his team believe that the Poseidon IV will be able to cut down on the costs associated with the current system and decrease the carbon footprint of the airport overall. He estimates that the device will cost about one fifth of the price of his competitors and could revolutionize the industry. While the device is only in the prototype stage, the device looks to solve one of the most common problems associated with public restrooms - cleanliness. While it may look like a space-age invention right now, the product may be sprucing up your toilet seat in the near future.